The Los Angeles Lakers dropped to 0-5 with their loss to the Phoenix Suns and there are growing signs that Kobe Bryant is just going to try to win games all by himself. Bryant took a whopping 37 shots in the game, making 14. It was the most shots taken in a non-overtime NBA game since Monta Ellis took 39 shots for the Golden State Warriors in a game during the 2009-10 season. 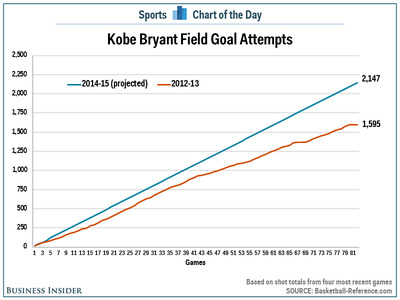 This came after Bryant took 28 shots in the Lakers’ previous game. He is now averaging 26.3 shots per game in the last four contests. Based on that rate, Bryant is on pace to shoot an absurd 2,147 shots this season which would be just short of his all-time high, 2,173 during the 2005-06 season and 552 more than he shot in his last full season (1,595 in 2012-13). It would also be the fourth-highest total ever for a guard. 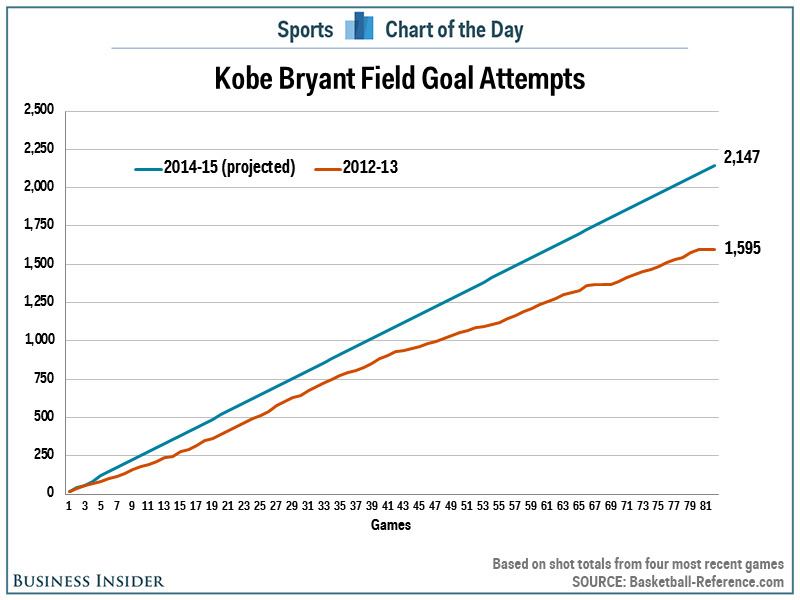 Of course, at some point, Bryant is going to need to take some minutes and games off to rest and his pace will slow. But this does show just how trigger-happy he is being with the lack of talent around him.